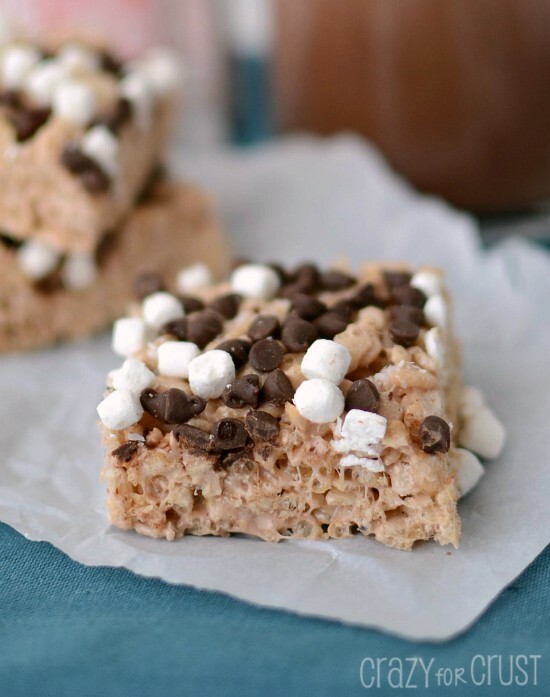 When you need a fast treat that will please everyone, make these Muddy Buddy Krispie Treats. They’re like eating muddy buddies in rice krispies treat form! I feel like it’s been awhile since I told you what I’ve been reading. I’ve read a few books lately that were amazing, so I want to share my list with you. Let me know what you’re reading in the comments; I’m always looking for good books! Most of these books can be read for free on Kindle Unlimited. If you read a lot, it’s totally worth the monthly fee. We’re All Damaged by Matthew Norman – it’s hilariously funny. It actually reads like you’re watching a comedy movie. Good As Gone by Amy Gentry – I saw this reviewed in EW magazine and decided to give it a try. I really, really liked it. My Girl by Jack Jordan – heart wrenching and at times hard to read, a little soft on the ending, but still really good. Everything We Keep by Kerry Lonsdale – a good story, the plot has some good twists and turns, it kept me reading. Closed Circles (Sandman Murders Book 2) by Viveca Sten – read book 1 first, they’re both really good! In Twenty Years by Allison Wynn Scotch – I really enjoyed this novel, possibly because I’m the same age as those in the book, and it’s about coming to terms with what you’ve done in your life since college. Ashley Bell by Dean Koontz – his novels are the only I’ll pay full Kindle price for. Enough said! I have more in my queue to read…but these got me through the summer. 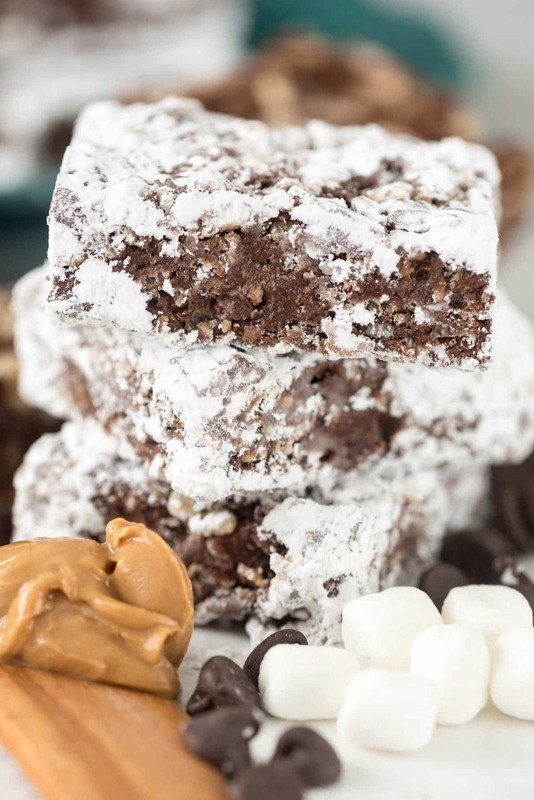 Now…let’s talk about how I turned muddy buddies into rice krispies treats. !!! At the end of summer I let Jordan throw a pool party with her girlfriends. I always have treats on hand but I needed to make something dairy-free because a friend who is allergic to dairy was coming over. Now, if you’re thinking to yourself that Rice Krispies Treats are not dairy-free, don’t worry. They can be! I actually made versions of these all summer long – they’re my new favorite go-to dairy-free dessert because they’re done in just a few minutes with no baking. I simply replace the butter called for in the normal krispie treats recipe with vegetable oil. You can also use coconut oil! I add peanut butter to the mix as well, because I’ll never say no to peanut butter. 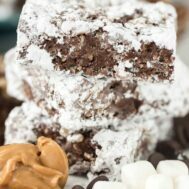 That last day of summer I was wondering what I could do to the treats to make them different and I immediately thought of muddy buddies! 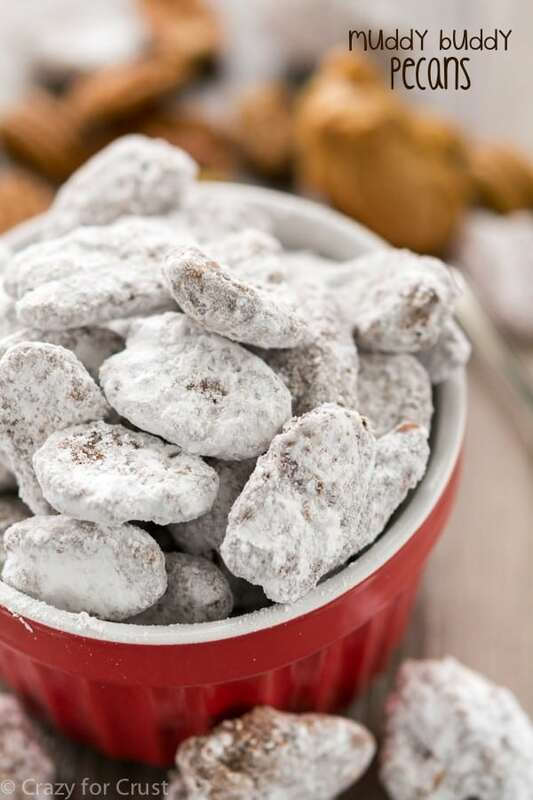 Muddy Buddies are a sweet treat made with Chex cereal that’s coated with chocolate and peanut butter and then shaken in a bag of powdered sugar. It’s a messy heavenly snack that I cannot be around. Seriously, put me near a bowl of muddy buddies and they’ll be gone in 2 minutes flat. So of course I decided to marry two iconic treats. I made my rice krispie treats with peanut butter and melted chocolate chips, and then I rolled the treats in powdered sugar before serving. 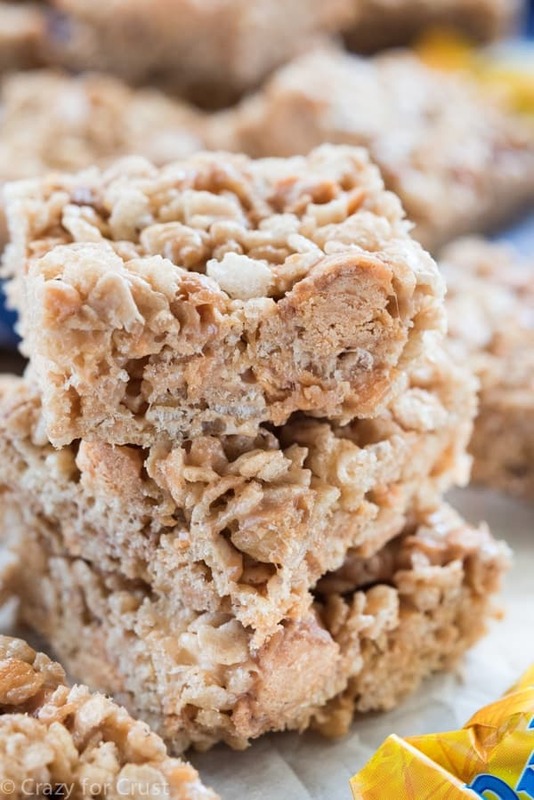 I think Rice Krispies Treats are the easiest no-bake treat to make. Literally they take about 10 minutes. And when you add the flavors of puppy chow (what midwesterners call muddy buddies)…it’s priceless. You MUST try these! 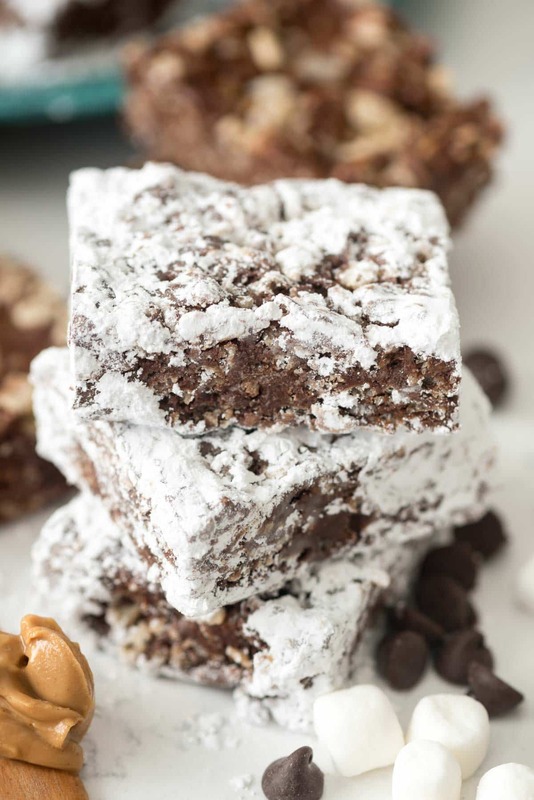 Muddy Buddy Krispie Treats - an easy no bake rice krispies treat with peanut butter and chocolate coated in powdered sugar! Line a 9x13” pan with foil and spray with nonstick cooking spray.